COLLEGE PARK, Md. — Lisa Tostanoski, a graduate student in the University of Maryland’s Fischell Department of Bioengineering, has won a $15,000 Lemelson-MIT Student Prize following a highly competitive nationwide search for the most inventive college students. 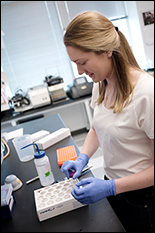 Tostanoski was selected for her efforts to develop two novel biomaterials-based strategies to combat multiple sclerosis (MS) and other autoimmune diseases. The nine recipients of this year’s collegiate competition were selected from a diverse applicant pool of undergraduate and graduate students from colleges and universities across the country. Tostanoski was one of two graduate students awarded this year’s prize for the “Cure it!” category, which recognizes students working on technology-based inventions that can improve health care. Recently, scientists have explored the potential to use vaccine-like therapies to treat autoimmunity. Such techniques aim to specifically control the attack of self-molecules – like myelin in MS – while leaving the rest of the immune system intact. In MS, the immune system incorrectly recognizes myelin, which insulates and protects nerves fibers in the brain. Immune cells enter the brain and attack, leading to slow loss of motor function and other complications. Current therapies for MS work by decreasing the activity of the immune system; but, they do so in a broadly-suppressive way that often leaves patients vulnerable to infection. In search of a solution, researchers like Tostanoski are working to develop new strategies that enable control over combinations and doses of therapies that reach particular tissues in the body. Tostanoski’s first project applies a targeted injection technique to deposit degradable polymer carriers – loaded with the desired therapeutic cargos – directly in lymph nodes, the tissues that coordinate the body’s immune responses. These particles slowly degrade in the lymph nodes, releasing signals that program cells not to attack “self” tissues. Instead, these cues aim to expand regulatory immune cells that could then leave the lymph nodes and move to the brain and spinal cord to control inflammation and disease. The research team, which joins together the Jewell Lab and the immunology lab of Dr. Jonathan Bromberg at the University of Maryland School of Medicine, is currently working to understand the mechanism as well as the translational potential to other disease models. In the second approach, Tostanoski and fellow researchers use specialized technology to create immune polyelectrolyte multilayers (iPEMs) built entirely from immune signals. These iPEMs are self-assembled on particle templates during production. Then, the templates are dissolved to leave hollow capsules that consist only of the immune cues the lab wants to deliver, eliminating the need for carrier components. Tostanoski, Jewell, and Dr. Walter Royal of the University of Maryland School of Medicine have shown that this approach controls inflammation in samples from human MS patients, and eliminates disease in mouse models of MS. This cutting-edge technique mimics useful features of biomaterial therapeutics – such as co-delivery, targeting, and “cargo” protection – but is much simpler because no carrier components are needed. Even more, this feature also eliminates the risk of activating the immune system in the unintended or unexpected ways sometimes associated with synthetic materials. The Lemelson-MIT Student Prize is supported by The Lemelson Foundation. Student prize applicants were evaluated by screening committees with expertise in the invention categories, as well as a national judging panel of industry leaders. Screeners and judges assessed candidates on breadth and depth of inventiveness and creativity; potential for societal benefit and economic commercial success; community and environmental systems impact; and experience as a role model for youth. Prior to receiving the Lemelson-MIT Student Prize, Tostanoski was named a National Science Foundation Graduate Research Fellow and the University of Maryland’s 2015 Fischell Fellow. She has also contributed to five intellectual property filings, to date. This work was supported by grants to the Jewell Research Lab from the National Multiple Sclerosis Society, the U.S. Department of Veterans Affairs, and the National Science Foundation. The University of Maryland’s A. James Clark School of Engineering is a premier program, ranked among the top 20 in the world. Located just a few miles from Washington, D.C., the Clark School is at the center of a constellation of high-tech companies and federal laboratories, offering students and faculty access to unique professional opportunities. Our broad spectrum of academic programs, including the world’s only accredited undergraduate fire protection engineering program, is complemented by a vibrant entrepreneurial ecosystem, early hands-on educational experiences, and participation in national and international competitions. The Clark School is leading research advancements in aerospace, bioengineering, robotics, nanotechnology, disaster resilience, energy and sustainability, and cybersecurity. From the universal product code to satellite radio, SMS text messaging to the implantable insulin pump, our students, faculty, and alumni are engineering life-changing innovations for millions. Learn more at www.eng.umd.edu.